Alexander Untschi was born in Munich to Ukrainian and Caucasian parents. He starting taking piano lessons at age five. At twelve, in parallel with grammar school, he commenced his pianistic training at the Munich Musikseminar, an institute for highly gifted musicians. There, he studied with Prof. Walter Krafft until the age of eighteen. Upon graduating, he moved to Vienna to study at the University of Music and Performing Arts. There, he entered the class of Paul Badura-Skoda and acquired a large repertoire focused on the Viennese classics: Haydn, Mozart, Beethoven and especially Schubert. His repertoire includes the complete piano sonatas of Mozart. During his twenty years in Vienna he participated in numerous masterclasses, especially those of Elisabeth Leonskaja, Karl-Heinz Kämmerling and Bruno Leonardo Gelber. A prizewinner in numerous competitions, he has concertized as a soloist throughout Europe. 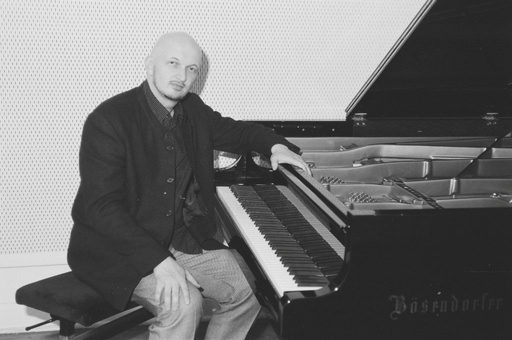 In addition to the solo piano literature, Alexander Untschi is dedicated to chamber music and lied accompaniment, collaborating with the Viennese baritone Georg Nigl, among others. Among the highlights of his solo career to date are piano recitals in Vienna’s Konzerthaus and the Herkulessaal and Residenz in Munich. Since 2006, Alexander Untschi has lived in Potsdam, near Berlin, where he has succeeded in reviving the world-famous master classes of the 1930s. Back then, Edwin Fischer and Wilhelm Kempff were the outstanding teachers of the Potsdam Master Classes. Meanwhile, prominent artists and pedagogues including Paul Badura-Skoda, Elisabeth Leonskaja, Karl-Heinz Kämmerling and Dmitri Bashkirov have been presented. Today, the Edwin Fischer Sommerakademie has established itself as an institution of distinction in Potsdam's cultural life and beyond. © 2017 Edwin Fischer Sommerakademie Potsdam e.V.